Converting destruction into art form isn’t new, but it’s the first time we see stadium demolition illustrated by artistic images. The more interesting it is to see MTK Budapest’s construction site. We’ve been writing about stadiums half our lives, but never saw an idea like this one. 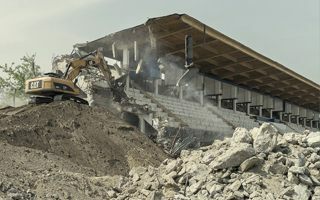 In Budapest the renowned football club MTK teamed up with Moholy-Nagy University of Art and Design to cover reconstruction of the Nándor Hidegkuti Stadion. It’s a brilliant way to honour this dated, but iconic stadium – one cherished by groundhoppers and fans of ‘old-school’ stadiums with decent architecture. But as we’re writing this, not much is left of that building. Early site clearing began in January and by now even the concrete main grandstand has partly given way to heavy machinery. Progress can be seen in the below film by Viktor Németh and great photos by Gergő Gosztom. Plan for MTK’s new home sees the stadium enclosed in outer coat of membrane. Only the east side stands out as three recesses in MTK’s club colour blue will be created to provide a more interesting façade. The stands with a single tier will be located on three sides of the field with some room for future expansion left in the south. Initial capacity of 5,000-5,500 complies with MTK’s expectations and ticket demand. Despite the club’s rich history, it’s hardly the most popular side in Budapest currently and international capacity of the old stadium was around the same level, regardless of large terracing. The entire stadium will sit atop a large pedestal, which will comprise club offices, commercial outlets and local sports museum, among other facilities. Initial reports expected the budget to be around HUF 6.5 billion, but currently figures of 4.5 billion are given (€15m / $16.5m), of which 3.9bn will be provided by the Hungarian government. Construction of the new stadium should begin in upcoming weeks. Delivery is set at late June 2016, leaving little time for delays, if such should occur.